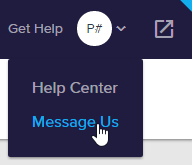 The best way to contact us is to log in to your store's Admin Area and hover over Get Help in the top right corner. Select Message Us to start a conversation with us through Intercom. This tool works a bit differently than chat software you may be used to. Think of it like text messaging on your phone, or Facebook’s messenger app. 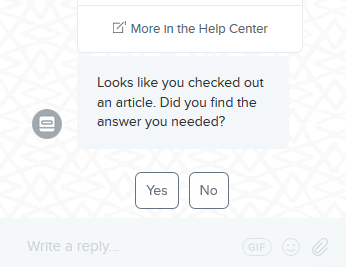 To start a conversation with us, click New Conversation at the bottom. Let us know what you need help with and we'll get back to you ASAP! For the fastest possible resolution, begin with a detailed and comprehensive description of your issue so we can spend more time helping you and less time asking you what kind of help you need. 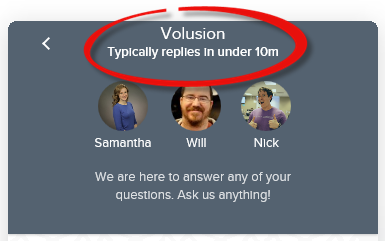 You'll see an estimated response time based on our current volume. 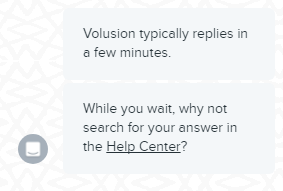 You can always search our Help Center for answers while you wait. Use the link provided in the response for quick access. If you haven't been there in the last 15 minutes, we'll instead suggest several articles for qualifying queries. If you click one to read, we'll ask you if you still need help. Select Yes to close your conversation, or No to remain in the queue. If you have any previous conversations with us, you'll see a list of them whenever you access Intercom. You can click on any one you like to review it, and add to it by typing in the Write a reply... box at the bottom. In order to keep your conversation history with us organized, we recommend starting a new conversation for each new issue you bring up. Otherwise, issues will get combined within a single conversation, making them harder to find later. Keep in mind that each administrator account in your store has its own Intercom account that's associated with your company's MyVolusion profile. If you have multiple stores with us, any Intercom accounts associated with one store's administrators won't be associated with another store's administrators, even if you use the same email address as a login value for both stores. 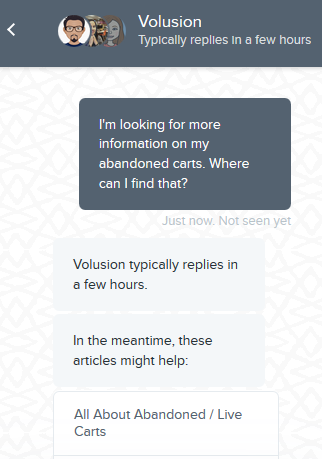 In MyVolusion, you can also select Get Help (under the my Support heading) in the left menu to see a list of inquiry-specific options. When you start a conversation from one of these locations, you'll see our current estimated response time. 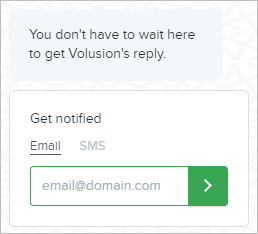 If we don't reply within a couple of minutes, you'll get an option to leave your email address or phone number for an email notification or SMS message on your phone as soon as we've replied. You can keep this conversation going as long as you need to, and come back to access it any time as long as you haven't cleared your browser's cache and cookies. Even if you don't sign up for email or SMS notification, you'll see an indicator that you have an unread message. We strongly recommend that when you need to contact us through Intercom, you do so from your Admin Area whenever possible. If you contact us from other locations, Intercom won't recognize you as logged in to your main administrator account, and any discussions you have with us won't be part of the conversation history in the account tied to your Admin Area. That may make it hard to find previous conversations in the future when you need to go back and reference them again. And if you clear your browser cache and cookies, conversations outside of your Admin Area won't be accessible again.